The 3100: Run and Become screening is this Thursday! "What would you do to transform your life? How far would you go for a metamorphosis? Would you drive, would you fly, would you run?" Join us after the weekly Wedge Run to check out this interesting, engaging, and enlightening documentary. The event will kick off at 7:30 pm in the Cloud Room at the Wedge at Foundation. We are asking for a suggested $10 donation, a book, or both. Everything collected will go directly to the Literacy Council of Buncombe County, our charitable partner for the upcoming Wedge Run 10k. It's been a busy few weeks for the ARC. 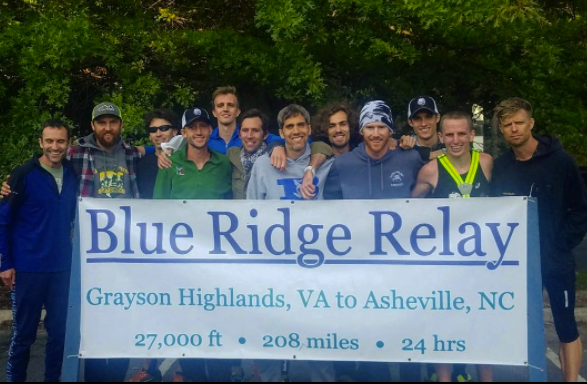 The Blue Ridge Relay on September 8th & 9th was a year-long focus for the club and required quite a bit of energy. Many of us have been walking (hobbling) around in a fog since hitting the finish line. There are plans to roll out some cool features on the run with stats, photos, and a detailed recap. The BRR was a big success for the ARC men. We got the win over the tough and talented Charlotte Running Club with a 30+ minute course record. However, we were not the only members of the Collective in action over the 200+ mile relay. Four ARC women competed on the winning mixed-ultra team, Jus' Running Ultra Maggots. Kate Schwartz, Ginna Reid, Anne Wheatly, and Ashley Arnold joined forces with Joe Ainsworth and Kurt Wilson for a new division record. Post-relay recovery differs from person to person. Tight muscles, aching tendons, and nagging injuries often plague runners in the days and weeks that follow. However, some runners, like Wil Norris and Anne Wheatly, bounce back quickly. 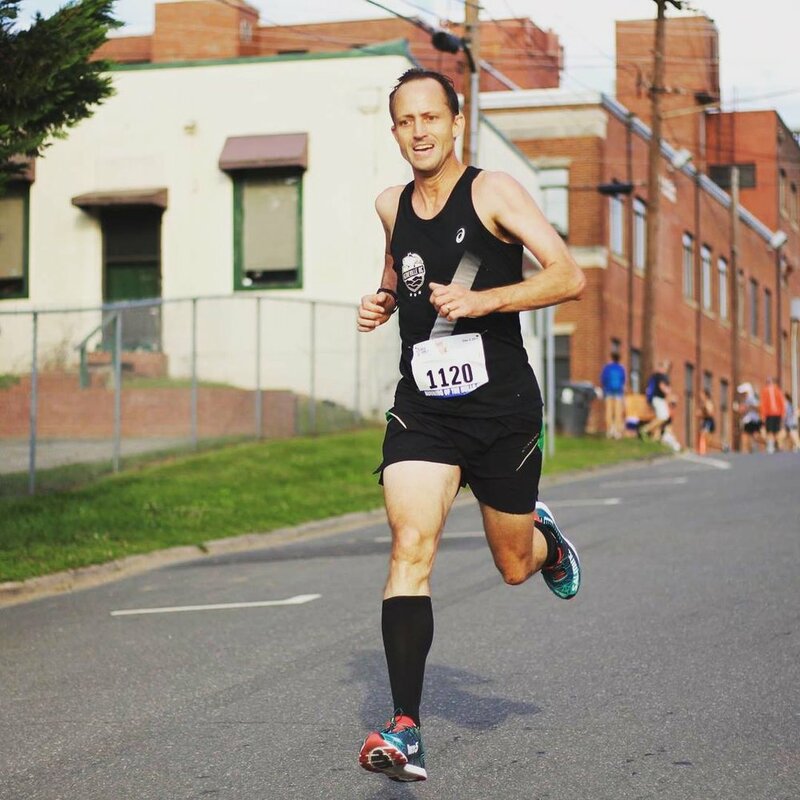 A week after his strong BRR performance (including a 58:30 up the 10.5 mile Grandfather Mountain leg), Wil doubled up with wins at a trail 5k on Saturday (Asheville, NC) and a half marathon on Sunday (Blacksburg, VA). For the half, he was joined by Phil Latter, who ran strong for 3rd place in his final Chicago Marathon tune-up. At Rock the Quarry, Anne's strength showed through as she snagged the win just a week after putting in 30+ miles at BRR. Impressive running! The next team race for the Collective will be December's USATF Club Cross Country Championships. In the meantime, we will have racers lining up for 5ks, marathons, and trail races. Stay tuned! Ashley Hunter Arnold was the lone member of the Collective in action this past weekend, as she toed the line for the China Grove 5k. This historically fast race has been an ARC favorite for years. It features a flat out-and-back course and often has a deep and competitive field. A 9:00 pm start helps mitigate the summer heat, but it’s usually still quite warm and humid. From the start, Ashley found herself running solo. Regardless, she took advantage of the quick course to run a very solid 17:51 for first female honors and sixth place overall. 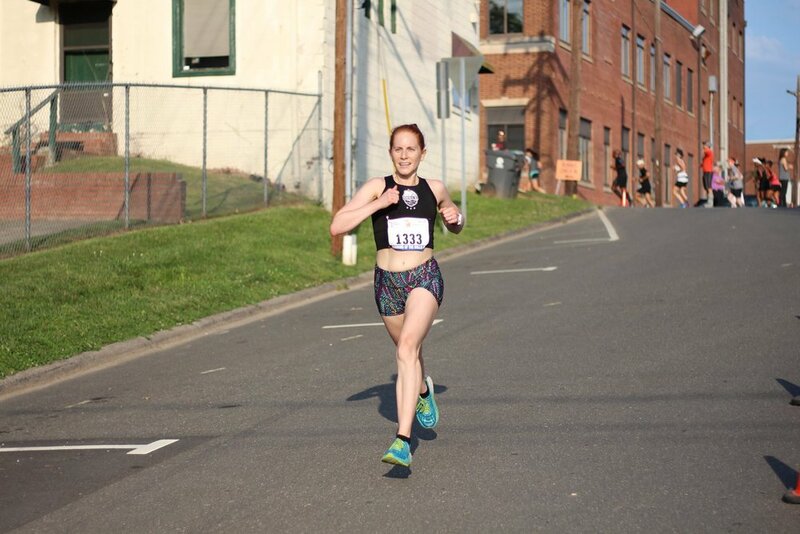 Keep an eye out for more fast times from Ashley and the rest of the Asheville Running Collective this summer. It was an exciting weekend for the Asheville Running Collective with the debut of our women’s team at the Running of the Bulls 8k. The team of Kate Schwartz, Ginna Lee Reid, Margaret Brennan, Natasha Shipman, and Ashley Hunter Arnold made a statement with all finishing in the top eight. “It was a lot of fun to have five ladies on the line together, to take the top three podium spots, and to be out there with the ARC guys”, said Schwartz, who earned the win on Saturday. On the men’s side, Alex Griggs and Frankie Adkins placed well with a strong third place and the master’s win respectively. We are still awaiting team results, but it should be close with Bull City Track Club in the mix gender division. Also representing on Saturday, Wil Norris raced the grueling Asheville Half Marathon, which winds in and around the hills of downtown and North Asheville. This event brings out some heat chasing a hefty prize purse. This year was no different and Wil had to settle for 5th after a hard fought 1:10 - a very legit time on this course! Two weeks back, Phil Latter lined up for his first track race since 2005 at the Atlanta Track Club All-Comers 5000m. Originally, he planned to pace one of his high school athletes for two miles or so, but he ended up staying in it and pushing to the finish in 16:00. He had quite the experience getting by lapped runners as there were 70+ runners on the track at one time! Over Labor Day weekend, Dave Workman took on one of the more challenging courses in WNC at the Rock2Rock Trail 10k. The trail shoots up from the start with 1500 ft of gain in the first three miles before a steep and treacherous descent back down. Dave had a great comeback race after months of hamstring issues and earned the overall victory. Hopefully, this is the start of a healthy and successful summer of running. The race schedule has been packed this year with Collective members competing in events in WNC and beyond nearly every weekend. This week was no different. Brent Schouler made his post-marathon return to racing with a win at the Run for Holland 10k in Spruce Pine. He will spend the summer hitting the roads and working on speed before taking another crack at 26.2 in the fall. In Philadelphia, Chass Armstrong raced the Broad Street Run 10 Miler for the second year in a row. His 53:44 result was off of his goal, but he’s excited to jump back into training and ramp up for a good summer and fall. Caleb Masland has been racing himself back into a very respectable level of fitness this spring. It’s fun to watch him improve every time he pins on a race number. His most recent effort was a win at the Carolina Brewsfest Half Marathon in 1:13:09. Also - Shout-outs are in order for two Wedge Run regulars who posted impressive performances last week. At the Legacy Run Half Marathon a rich prize purse brought out a competitive women’s field. Kate Schwartz made strong moves in the hilly second half to earn the win and a nice payday. Out in California, on one of the most strikingly beautiful courses in the country, Arek Robinson set a massive 10+ minute PR of 2:39:22 to place second in the Avenue of the Giants Marathon. It’s great to see your hard work pay off, Kate and Arek! 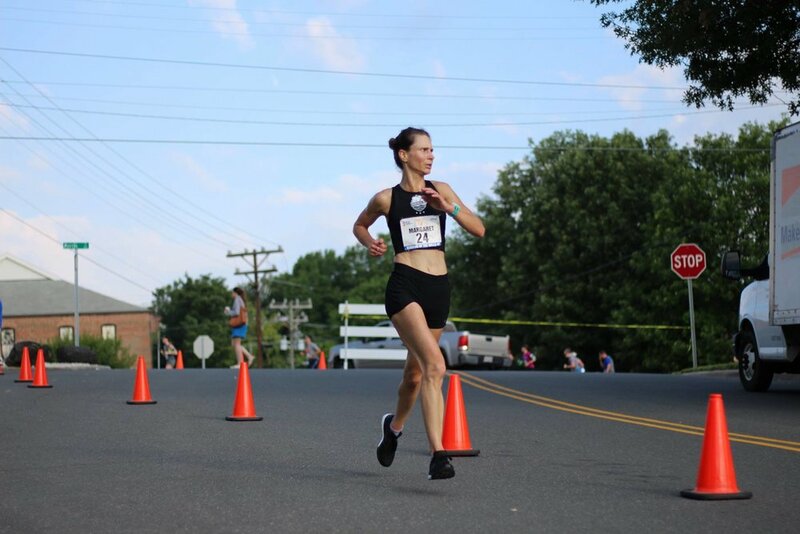 ARC put in work this past week with Javan Lapp pulling double duty in AVL and Frankie Adkins battling for a USATF masters podium spot in Massachusetts. On Saturday, Javan went back-to-back with two races in the AM. First up was the brand new Camp Cedar Cliff Trail Run 8k. After trading leads on the long ascents and descents with WNC newcomer Matthew Busche, Lapp had to settle for second after some strong climbing from Busche in the final section of the course. Next up was the Race to the Taps 5 Miler at New Belgium Brewing, Lapp ran strong on the tough climbs to start and finish the race (damn you, Riverview Drive!) and got the W. Solid day of work, Javan! On Sunday, Frankie lined up for his first USATF masters national championship of 2017 at the James Joyce Ramble 10k in Dedham, MA. Adkins planned to give himself a shot at a top-3 finish, so he set a strong pace from the start. 5k was passed in 16:07 before hitting the hilliest section of the course in miles 4 and 5. He came into the final 400m in a tight battle with 2nd-5th and finished a close 4th. The fact that he was outkicked by a 50 year old (Kristian Blaich of Atlanta) for 33-minute 10k shows the impressive depth and competitiveness of the USATF masters scene. In the end, Frankie finished 3rd in the 40-45 year old age group - good enough for some USATF hardware. More solid racing across the southeast for the Collective this past weekend. On Friday night, Alex Griggs competed in his first outdoor track race of 2017 when he lined up for the 10,000m at the Montreat College Invitational. His third place finish in 32:22 was a good start to his spring and summer racing campaign. In Richmond, Peyton Hoyal (On Running) put in good work at the Ukrop's Monument Avenue 10k. His 32:44 was good for 15th place in the deep field. Finally, Caleb Masland (Skechers Performance) continued building his fitness with a strong showing at the Foothills Brewing Hopswap Half Marathon. He got the win and notched a solid 1:13:07 on the hilly course. We’ve got a packed recap with some of the ARC’s best results of 2017. On Friday, Wil Norris (Salming Running North America) chopped 37 seconds off of his 10,000m PR with a blazing 29:51 (15:04, 14:47) at the Raleigh Relays. Wil, a grad student at App State, has spent the winter grinding out tough solo sessions up in Boone. His hard work has clearly paid off. Keep an eye out for more fast times as he drops in distance to attack PRs at 1500m and 5000m in the coming weeks. Brent Schouler also dropped a massive personal best this weekend with his 2nd place finish at the QuintilesIMS Wrightsville Beach Marathon 2017 in 2:34:41 (just behind race winner and friend-of-the-ARC Justin Pfruender) This was nearly 10 minutes faster than his previous best from two years ago. Brent’s ability to lock into a rhythm was on full display as he clicked off 22 of the 26 miles within 3 seconds of his average pace (5:52 per mile). Steady! Brent cruising in his favorite training venue—Carrier Park. With great performances on the track and roads taken care of, a pack of Collective racers took to the trails for the 2017 DuPont 12K Trail Race. In the first few miles, the lead changed several times with Shiloh Mielke (Astral) and Javan Lapp taking turns pushing the hills. Asheville newcomer Mike Zeberkiewicz, who hung back early, moved up and took control of the lead in the second half of the race. Shiloh gave chase, but Mike was able to pull away in the final couple of miles to take the win in 41:50. Javan came across for 3rd, Frankie Adkins in 5th, and Jerad Crave in 9th. Great racing across the board.